Assist the Center in producing projects! When you donate to CEM you are in the company of such notables as the Corporation for Public Broadcasting, The Osprey Foundation, Open Society Institute, Fund for Change, Stony Run Friends Meeting, and a number of individual donors. 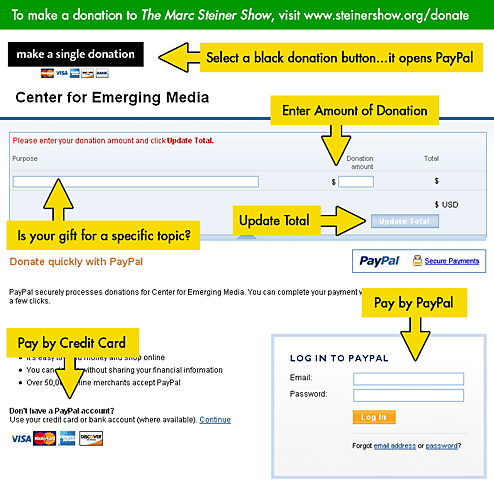 The Center for Emerging Media is a 501[c] non-profit organization. All donations are tax deductible to the limits the law allows. You also have the opportunity to sign up for monthly recurring donations. You only have to sign up once, and we will automatically bill your credit card each month. You can cancel at anytime. Click this button to donate a dollar a day. Click this button to donate $10.00 a month. Click this button to donate $20.00 a month. Click this button to donate $50.00 a month. Please Note: If you are giving to a specific project please earmark which one on your check to have it directed to that production.